Nufarm is once again putting its support behind Project EverGreen’s GreenCare for Troops, this time by contributing $150,000 to the program. In 2015, Nufarm supported the program—which provides free lawn and landscaping services to help families of active-duty military members serving away from home—by donating $15 to GreenCare for Troops for select product purchases. The contribution will be used to enhance and expand the national initiative created and managed by nonprofit Project EverGreen. This will include increased outreach for volunteer recruitment and communications to families, volunteers and the media, as well as adding promotional and logistical resources required to grow the GreenCare for Troops database and serve more military families and veterans. The GreenCare for Troops initiative has seen more than 11,000 military families and disabled veterans and more than 6,000 green industry professionals register to receive or provide these services since the program was launched in 2006. 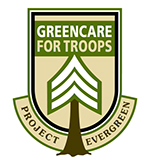 In 2016, Project EverGreen’s GreenCare and sister program SnowCare for Troops volunteers delivered lawn care and landscape services valued at $1 million to hundreds of military families and wounded/disabled veterans across the U.S.
Nufarm joins Toro as primary financial supporters of the GreenCare For Troops program.